A weird new trend has been going on in the bike world. Both awesome and ridiculous, it is changing the way we think about the supposedly steel horses while also giving us a proper laugh. 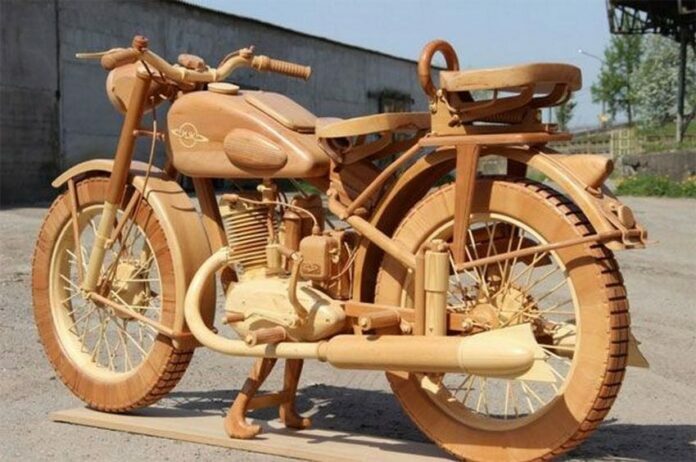 This new trend are wooden motorcycles. They are appearing in different shapes and sizes, some awesome and sublime, other rather awful and outrageous. This however is nothing new, as people have been using different machines in combinations with wood to make crazy designs of their own. 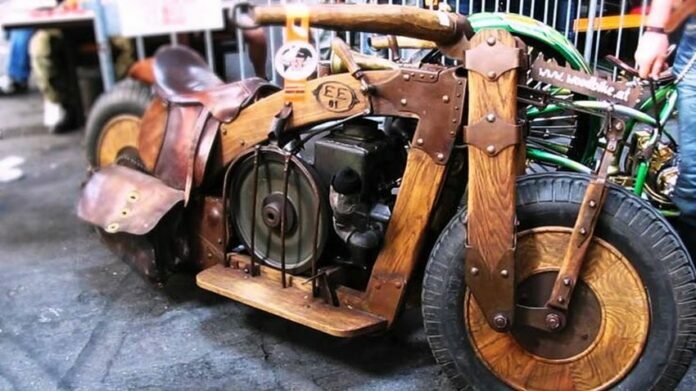 This wooden ride quite great, as it has some attitude others do not. 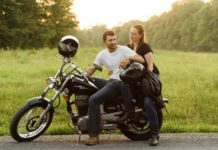 The personal touch is also special, with the leather saddlebags reminiscent of the Old West, which is an idea that goes well with the overall motorcycle myth and legend of the free, open road. However, there seems to be some cheating involved as all the mounts appear to be made of metal. Let us just say it is for the esthetics. A carpenter George Stempinski built this “Wooden Horse” in his garage in Stafford. 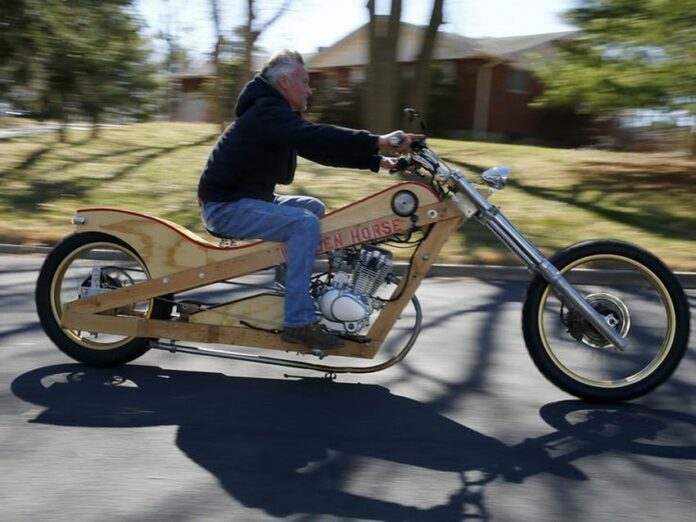 He says the idea came to him while he “was leafing through some old photos last year when he came across one of himself, at age 4, sitting on a child’s mini-chopper.” Therefore, he made himself a bike with 5 speeds and an estimated speed of 80-85 mph. A rather impressive feat for a bike made at home. A genius Hungarian Istvan Puskas constructed this three-seater and three-wheeler from pinewood only. 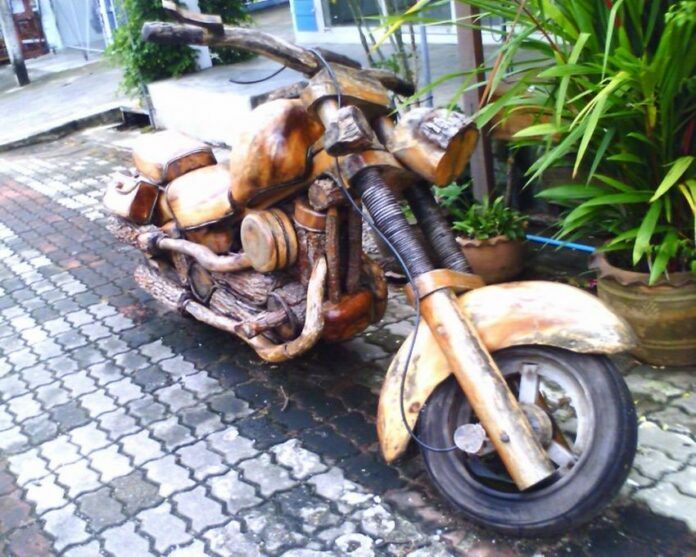 Everything is wooden except the mighty 200cc engine. The handlebars are the best part, as they are made from the horns of Hungarian grey cattle. A weird but amazing detail for a bike, don’t you think? 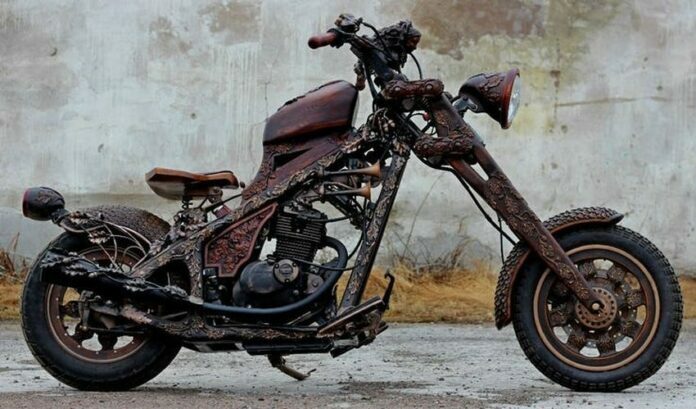 This Russian “Steampunk” bike a gem if you ask us. It is definitely not for everyone, but just look at that detailed scrollwork throughout the body. That does not only take a lot of time to complete, but an immense amount of talent. We can tell that this used to be a “real” bike once, and not a completely personal design. Nevertheless, we always give props where props are due. 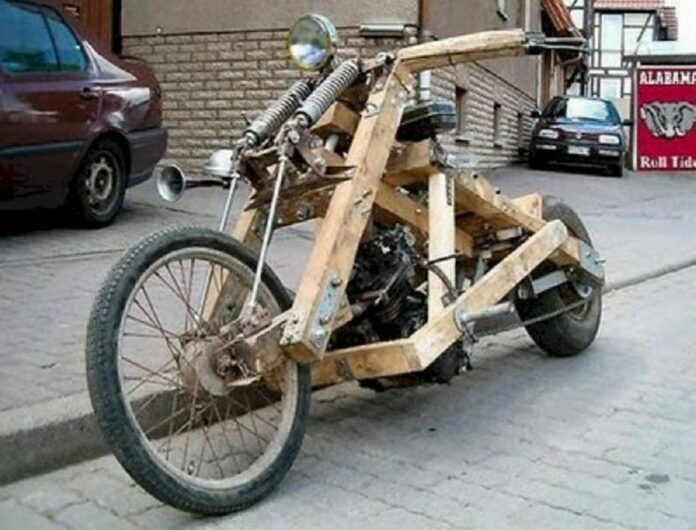 Although this motorcycle does not have as much wood in its parts as the rest, but that is fine. It is still without a doubt a cool bike. Actually, the seat of this bike is from an old Esprit Tobacco shed, which used to be all over the Southern states for drying tobacco crops. The tank on the other hand used to be a beer keg. Interesting choices for a bike to say the least. This is another piece of that amazing Hungarian artisan by Istvan Puskas. 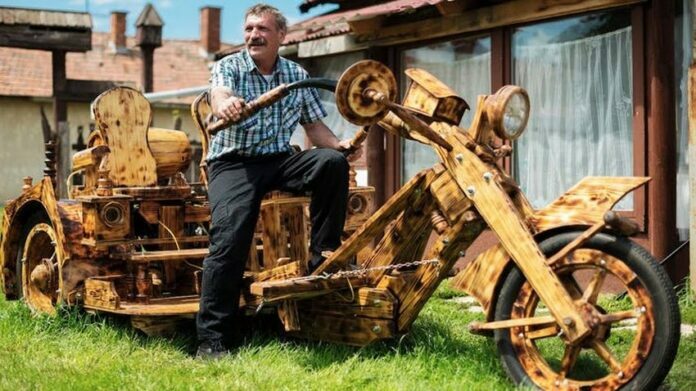 His wooden chopper is made from random parts that were just lying around his yard, all scrap basically. However, this is a pretty impressive piece of engineering, honestly, and a beautiful bike with all the necessary classic chopper lines. 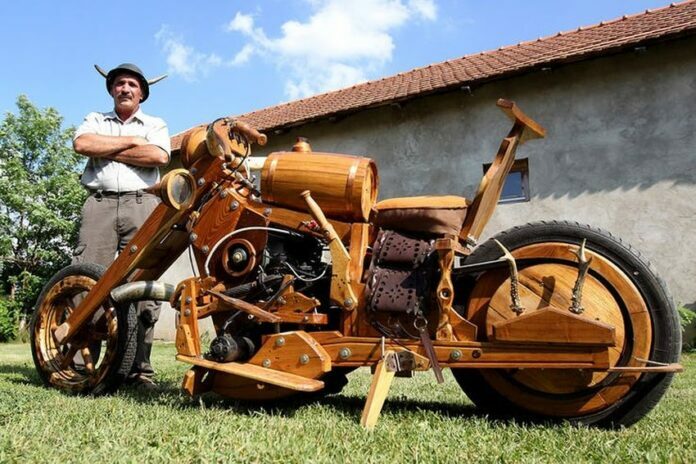 Puskas has become somewhat of a YouTube celebrity for his wooden vehicle designs. This breathtaking bike just oozes lust, envy and desire. 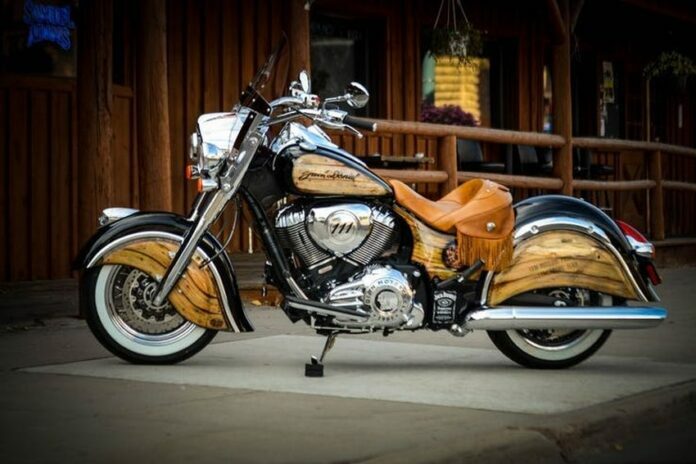 This full-bore Indian is customized with and for Jack Daniels. Just look at the grain in that wood, it has to be the nicest you have seen on a vehicle. 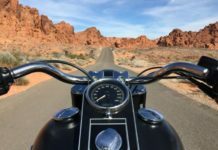 The bike has a 2013 Indian Thunderstroke 111 engine, with 1811cc. This is an air-cooled, 49-degree V-Twin with 111 cubic inches from a 101mm bore and a 113mm stroke. This is the dream bike for any motor head. 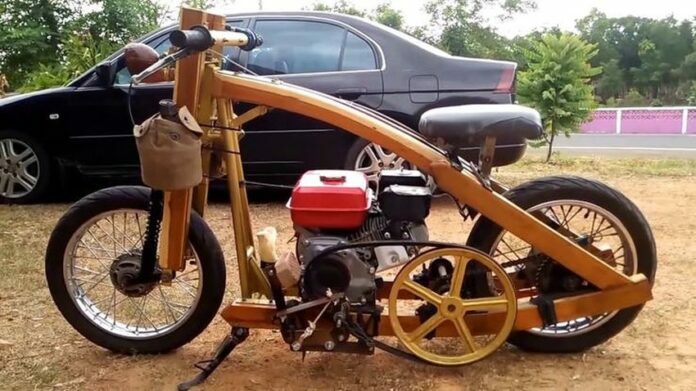 Alright, now this bike is powered by a Briggs & Stratton lawnmower engine, and does not look that safe. The tires look sturdy enough, and the seat is quite though. It even sports a flywheel and a cup holder. 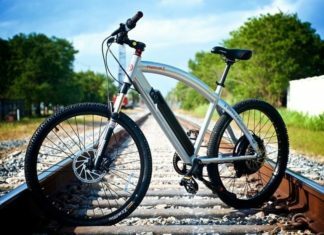 However, compared to some previous bikes on the list, this one would probably be a “pass” by most of the readers. 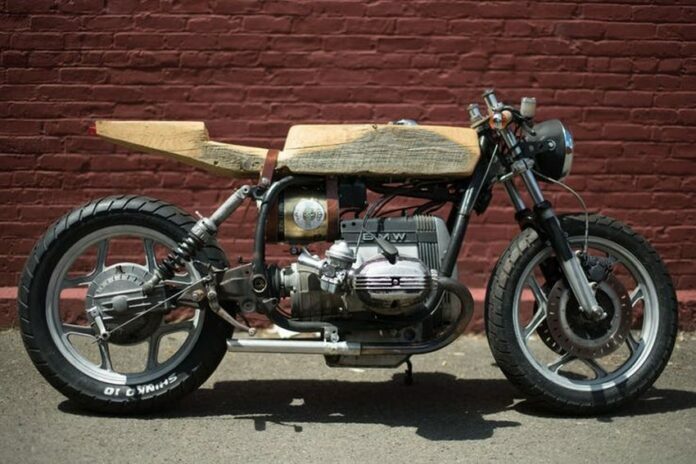 It is a great DIY bike, without a doubt, but only for the person who made it. This one gives us a crack every time we look at it. This was probably made by a younger person, as there is no way a grown adult would ride something this silly. It look like someone decided to assemble a bike at any cost while digging up through their thrash. It looks like it took them no more than 15 minutes to say “I think this will do it”. The bicycle horn is a great detail.